Toothpastes are generally either white abrasive pastes or clear gels. Although the formulations differ, they share many common ingredients; these may vary from country to country according to legislation on use of ingredients, etc. The liquid base is prepared first - water, sorbitol/glycerin and other liquid ingredients. Rheology modifiers may be pre-mixed with a non-aqueous liquid ingredient such as glycerin or the flavouring oil, or dry blended with other powdered ingredients to aid dispersion. The active ingredient, sweetener and preservative are added and dispersed. The abrasive/filler is then added. This may be supplied as a slurry, or premixed with part of the water prior to blending with the liquid base. Flavouring and colouring are added. The detergent is added last under slow speed agitation to minimise foaming. It is typically in solid form to avoid adding water to the formulation at this stage. Rheology modifers tend to form lumps which are difficult to break down by agitation. Premixing with other liquid or powdered ingredients increases process time and costs. Some rheology modifiers require high shear in order to obtain functionality. Some ingredients, e.g. hydrated silica have a low density and are very difficult to incorporate and wet out. Conventional agitators tend to cause aeration, especially when incorporating powders. Abrasives such as calcium carbonate can be supplied as a slurry. These may require deagglomeration. Preparation of the liquid base prior to the addition of the fillers and abrasive ingredients. Deagglomerating the mix before the detergent and thickeners are added, especially where fillers such as calcium carbonate are supplied as a slurry. “Refining” of finished product prior to packing. This would be carried out using a specially modified In-Line unit. 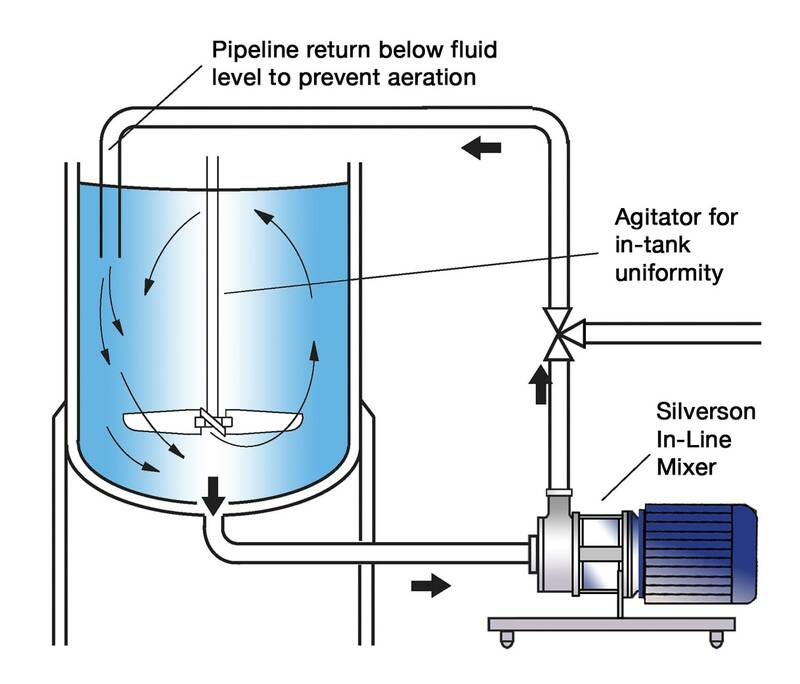 We offer mixers capable of handling higher viscosities but a non-reciprocating positive displacement pump may be required for some products. The high speed rotation of the rotor creates a powerful suction which draws the liquid and solids into the rotor/stator assembly. Centrifugal force drives the materials to the periphery of the workhead where they are subjected to a milling action in the gap between the rotor and stator. The product is then forced out through the stator as fresh material is drawn in. The continuous intake and expulsion of materials ensures the ingredients are deagglomerated and rapidly dispersed and/or hydrated. Processing time is dramatically reduced. Rapid incorporation and wetting out of powders. Greatly improved product quality, consistency and stability. Minimised aeration; certain units can be supplied for operation under vacuum.